how-to guide for making a sash. There are three ways to have the sash of your dreams. The sash is often known as the Baldrick. This comes from an older name for a sword belt. Please note that you should not use the crown and Royal Cypher unless you are entitled to it! 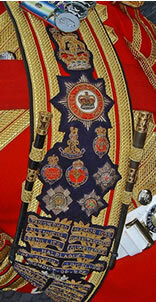 There are too many sashes being worn out there that have it on that should not, so unless you are in a services band or some other Royal institution's band that is entitled to it do not have it put on your sash. If using double braid allow 35mm from outer edges of sash: outer edge, braid, colour divide (5mm), braid. Single 1” braid can also be used instead. Badges may overlap braid (quite common). Allow approx. 120mm-230mm for cypher or top badge to show properly beneath plaid! Individual sashes should be tailored first with a paper pattern to get curvature and measurements right. The bottom edge may be finished in fringe to match the braid. The picture on the right is the sash of the Gurads Division. 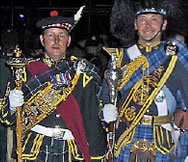 It was worn by DM Colin Aileen of the Irish Guards (formerly a drummer in the Scots Guards pipe band), as Senior Drum Major in the British Army. Note the extra wide double braid and all of the Guards badges. the Highlanders, the Royal Highland Fusiliers, the King's Own Scottish Borderers and the Royal Air Force.